Gift-giving is an art form in Japan. A lot of etiquette is associated with the exchanging of gifts, and one can easily find websites that list Japanese gift-giving suggestions and customs. Here I will discuss a couple of customs as well as share a few of the many gifts we received and the stories behind them. Omiyage (おみやげ) is usually translated as “souvenir” in English, but that is a wholly inadequate description. For most native English speakers, a “souvenir” is usually a little knickknack you pick up for yourself or to serve as a gift for people back home as a reminder of your trip. Japanese people are constantly exchanging omiyage. Most hosts we visited and/or stayed with gave us little gifts. When friends meet they often exchange gifts. Because space is at a premium in Japan, omiyage are commonly things to eat, either home-made or perhaps a food typical of that particular region in Japan. You don’t necessarily want to give someone something that will take up precious shelf/desk/counter space. So edible omiyage are always a safe bet. Gifts are usually very carefully wrapped. In fact, most stores will have already-wrapped gift boxes of mochi, sweets or fruit for sale. When you receive a gift, it is usually good form not to open it at that moment, but take it home and open it there. This is intended to prevent the awkwardness of opening a gift and perhaps not being completely pleased with it, which causes the giver to lose face. For us Westerners, these expectations did not apply, however. Everywhere we went, we received gifts. Fortunately, our hosts understood our need to pack light and small, so most of the gifts were also small and rarely fragile. Here are a couple of gifts we received, each with its own interesting story. 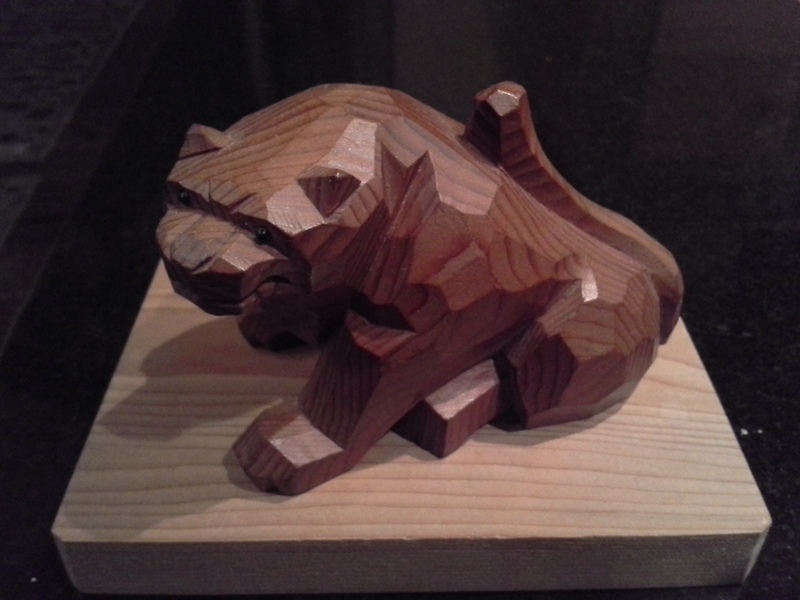 This is a hand-carved tiger. 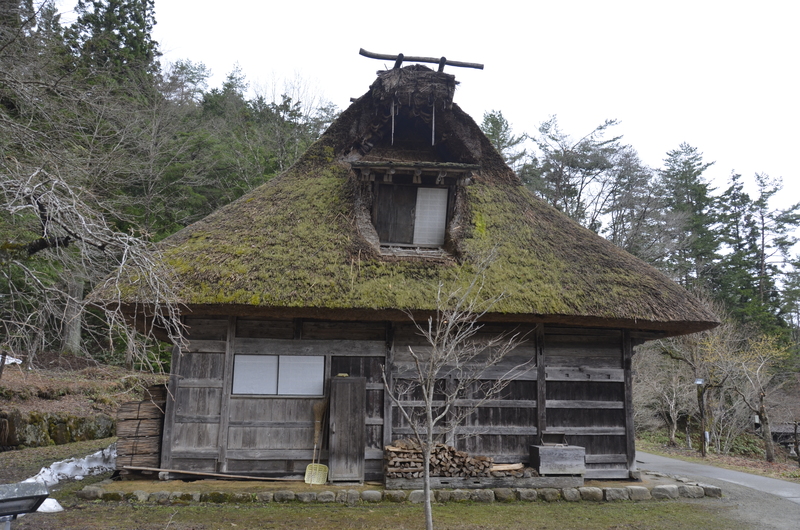 I purchased it in Takayama at the Hida Minzoku Mura Folk Village ( 飛騨民俗村) where buildings 100 to 500 years old have been preserved so one can see how people lived centuries ago. 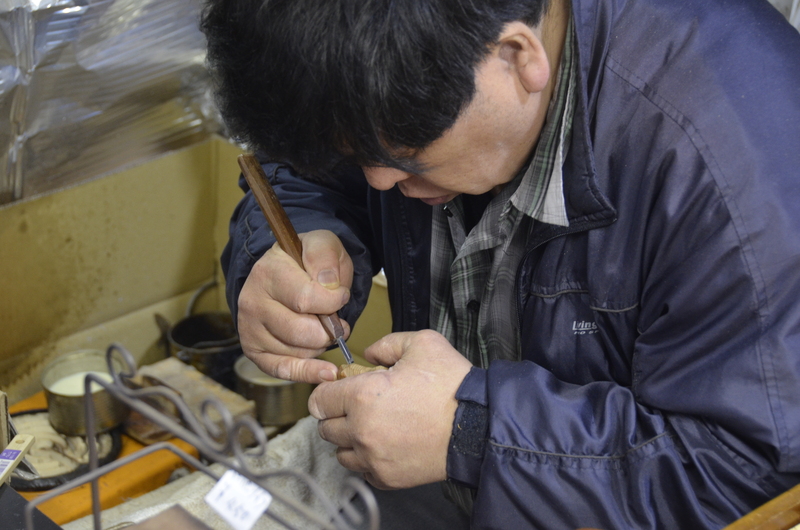 There was a wood carver practicing the Ichii Ittobori (One-Knife) wood-carving technique. Here is a short video about the technique. The wood is yew. Over time, it will become darker and richer in color. 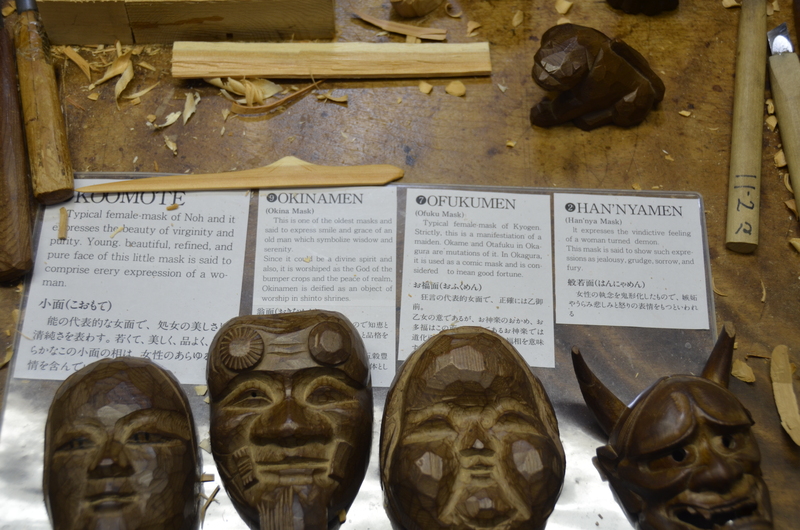 I enjoyed looking over the wide assortment of animals, masks, and netsuke he had carved. 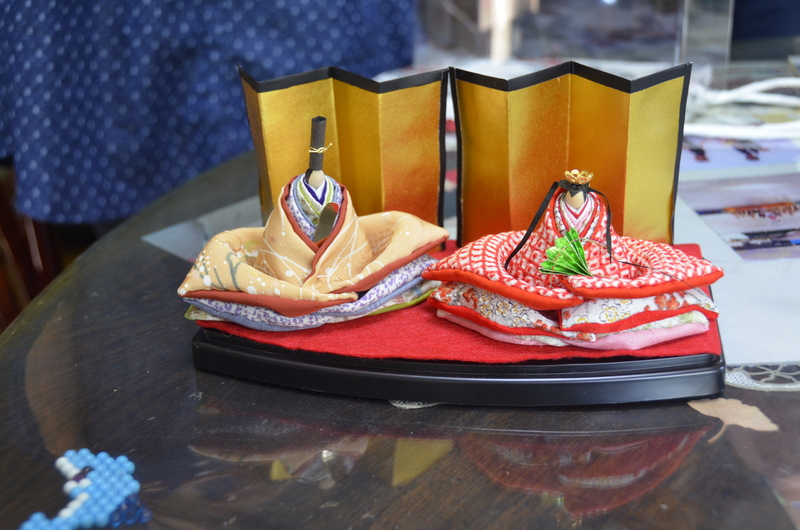 These are Hina-Ningyo dolls that represent the emperor and empress. These are displayed to celebrate Girls Day (Hinamatsuri or 雛祭り) on March 3rd. Sometimes, dolls of the emperor and empress, along with an entire court of ladies, musicians, ministers, and more, are set up on a stairway of multiple tiers. I remember my mother setting up one of these displays when I was young during the early spring. These two were hand-made by a dear friend in Tokyo. She knew it would be a bit awkward for us to pack and carry on the plane, so she asked us if we wanted to try. I loved them and assured her, “we’ll find a way!” And I did; I hand-carried them all the way home. I think our Hina-Ningyo will be displayed year-round, not just in March. The gift of these prayer beads brought immediate tears to my and my mother’s eyes. 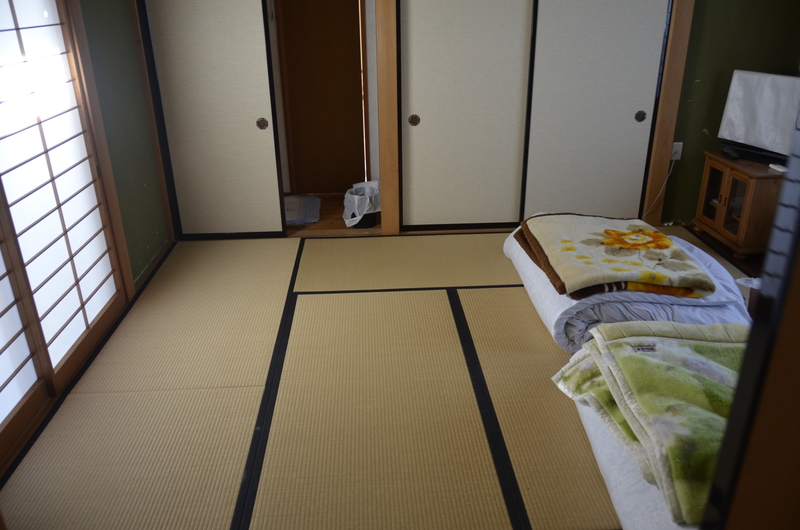 The beads are related to the “Children of Keishoji” I introduced in a previous blog entry. As I related before, my grandfather’s nephew was a Buddhist priest. The priest and his wife had eight children, but his wife died tragically in childbirth at age 37 while bearing their eighth child, a boy. Her younger sister, Yaeko-san, married the priest, brought an adopted daughter with her, and had an additional daughter with the priest. That brought the total number of children in the household to ten. Postwar Japan was starving and short of supplies, and the care packages my grandfather sent the family have never been forgotten to this day. The warmth, respect, and gratitude bestowed upon us was truly moving and humbling. I met Yaeko-san 19 years ago when she was 70. She passed away in 2008, but her strength and compassion lingers on and is palpable within the walls of the temple and in the kind hearts of her children, grandchildren, and great-grandchildren. 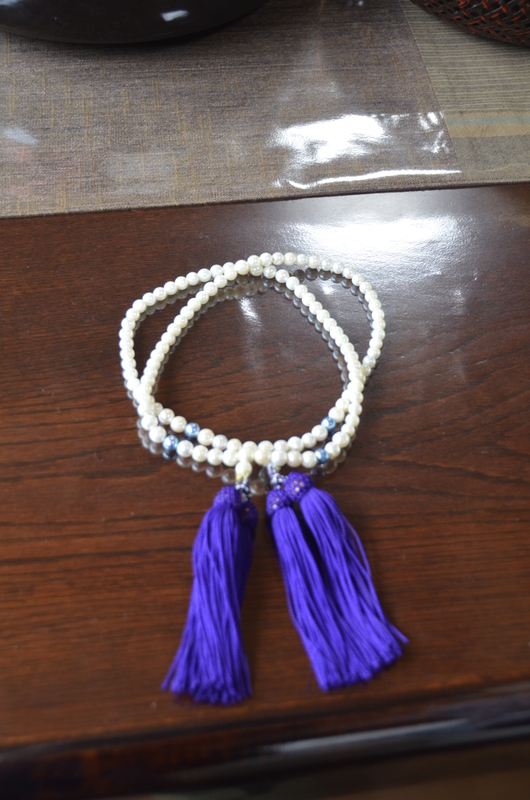 This is why, when Yaeko-san’s youngest daughter, the tenth child of Keishoji, presented her mother’s pearl prayer beads to my mother as a gift, we were both overwhelmed with emotion. It was difficult to accept such a precious and monumental item. But the youngest child of Keishoji believed that it was my grandfather who helped them all to survive during the very worst years of privation and need after the war. Just thinking about it still really stirs my emotions. It reminds me how precious and fragile life is, and to think about what gifts and service I may give others that will still be remembered and appreciated in five, fifty, or more years.